When you next head out to eat, take a close look at the menu. You see a lot of familiar options, don't you? That's because most menus feature several common dishes – for example, a burger or grilled chicken. We at the Better Buying Lab term these ubiquitous items "Power Dishes." Everyone knows them, and many like them. They are characterized by their strong consumer awareness, ability to be adapted across many different dining formats and occasions, and widespread appeal. They are also rarely plant-based. According to research by Technomic, in Britain, only two of the top 25 most common dishes are plant-based; in the United States, only one of the top 25 is plant-based. 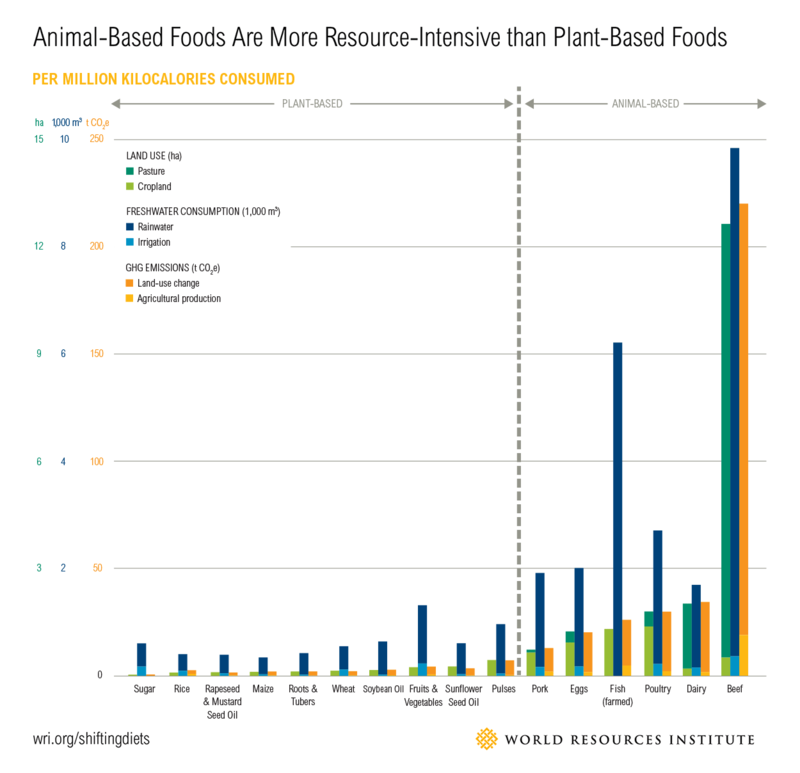 In a world that needs to decrease its carbon footprint, that's a problem as meat and dairy are responsible for two-thirds of total greenhouse gas emissions from food production. So here's the question: How do we popularize dishes centered around vegetables, legumes and other plants – dishes that are better for the environment and can help people eat more sustainably? We Must Foster New "Power Dishes"
For years, the meat industry has found new and successful ways of marketing its products. Pulled pork in the United Kingdom is one of my favorite examples. In 2011, the UK pork industry expanded on the American BBQ tradition to accelerate the adoption of pulled pork in Britain. The UK's AHDB Pork Board ran a series of campaigns that helped grow pulled pork's menu penetration by 21,900 percent in just six years, according to Horizon's Menu Trends Report from August 2016. That helped expand overall consumption of pork – a traditional meat in the UK that had seen declining consumption. I believe that same kind of leap can also happen for delicious, planet-saving foods. For the past year, WRI's Better Buying Lab has been working with some of the biggest companies in the business— including Hilton and Google—to identify potential new Power Dishes. These are dishes that put plants at the center of the plate, taste great, build on what consumers already know and love, and work for a range of food service outlets. The Lab started this work by closely analyzing menus to identify the traits of a Power Dish and which current dishes are growing fast on menus. Through consultations and workshops with chefs and tastemakers across food service, we identified those that could be modified to feature more plants and tested the new dish concepts in some of our members' cafeterias and restaurants. The Lab hosted a Grand Tasting at Google's California campus, bringing together chefs and tastemakers from across food service and the United States to hone in on promising Power Dishes. The Veggie Bowl (also often called a Buddha Bowl or Power Bowl) is a bed of grains topped with a range of plant-based ingredients. It's well-known on the East and West Coasts of the United States, but not across the country, and it appears on a limited number of menus nationwide. The Blended Burger, a mix of 70 percent beef and 30 percent mushroom, was first developed by the Culinary Institute of America with the American Mushroom Council. This updated burger has seen early traction on menus across the United States, including those of Better Buying Lab members Google, Stanford University and Sodexo. And it's got the potential to scale even further in the United States and to be introduced in Europe. With the mushrooms' umami flavor, the blend offers superior taste and it is healthier than the all-beef patties, as well. And because beef is one of the most resource-intensive foods to produce, swapping out 30 percent of the ground beef for mushrooms could make our burger habit much more sustainable, too. See a recipe example here. Click to open in a separate tab. The Avocado Club is a new spin on the classic Club sandwich featuring – you guessed it – everyone's favorite, the avocado, in lieu of chicken. Better Buying Lab member Hilton has been trialing the Avocado Club's popularity, with good results. Because the dish completely swaps out chicken for avocados, it yields a sizable environmental benefit. For example, one recent analysis found that, on average, producing a kilogram of poultry leads to roughly four times the amount of greenhouse gas emissions as producing a kilogram of avocado. Avocados are also a clear winner in terms of land use, as producing a kilogram of poultry meat requires about 20 times as much land as producing a kilogram of avocado, according to data from the U.N. Food and Agriculture Organization and WRI. Because avocado production can use significant amounts of irrigation water and, if air freighted, produce transportation emissions, procurement managers should conduct due diligence of their avocado supply chain to ensure sustainability. How to Mainstream Plant-Based Foods? In high-end and niche markets, exciting culinary developments are pushing plant-based foods to new heights. But the challenge is how to mainstream the movement. The foods we eat are shaped by a lot of factors, including what's available to us when we eat out. Imagine if more of those options were better for our health and that of the planet. And imagine if demand for these dishes made them the profitable option for a range of food service outlets, too. The Power Dish approach offers people sustainable dishes they want to order when at a fine dining restaurant or picking up dinner from the fast-casual spot on the way home from work. That's the potential of Power Dishes. The Lab is next working with partners across the food industry and culinary institutions to further test and refine these dishes. If you are interested in learning more or becoming involved, contact us at BBL@wri.org.